The Viavito Sumi folding rowing machine provides good practicality and smooth and enjoyable rowing action, letting you comfortably train the upper and lower body muscle groups. 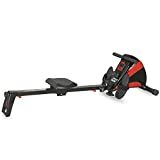 This indoor rower comes with a 7kg (15.4lbs) flywheel and 10 levels of magnetic resistance that are controlled manually to alter the intensity of your workout. The LCD display shows live feedback on your progress, with time, distance, calories, count and strokes per minute all measured and displayed. The seat is comfortable with an ergonomic design and the foot pedals are large. The 76cm (30″) row length and the smooth 4-roller system with its commercial-quality rollers come together to deliver flowing rowing motion which you will enjoy. The foldable rower is easier to store and features transport wheels. This entry was posted in Fitness Products and tagged Black, Folding, Machine, rowing, Sumi, Viavito by Summer 365. Bookmark the permalink.